At the recent Chicago Automate 2013 show of automation and robotics, Yaskawa Motoman drew huge crowds to watch its SDA10F double-armed robot deal blackjack for three players. The two-armed bandit not only deals cards, but can read the cards dealt, and play according to the rules of blackjack. The level of dexterity, along with the robot’s vision recognition camera and software, wowed the throngs attending the show. Yaskawa Motoman is a leader in automation of manufacturing. The company currently produces over 175 distinct robots, and has over a quarter million robots in the field. It also has a sense of humor, as suggested by its presentations at numerous robotics shows. Yaskawa has been developing its robotic blackjack dealer for several years now, migrating to different robots and software to gain new capabilities as such are developed. 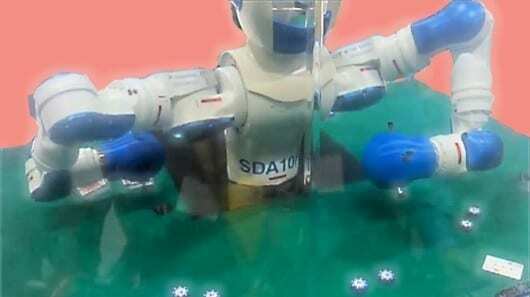 The current robotic platform for the robot dealer is an SDA 10F, a semi-anthropomorphic robot with two arms connected to a rotating torso. Each arm can lift 10 kg (22 lbs), and has seven axes of rotation, with each axis reaching a rotation speed of one-half to one rotation per second. This gives the SDA 10F fast and flexible motion, although no human has ever moved in the manner of these arms. As you will see in the video, the SDA 10F must transfer the cards from one hand to the other in order to deal the cards face up. Also, the axes do not allow 360-degree rotation, so movements usually involve a lot of awkward-looking maneuvers. Despite these constraints, the SDA 10F gets the job done – jobs including such operations as assembly, parts transfer, machine tending, packaging and other handling tasks that formerly could only be done by people.